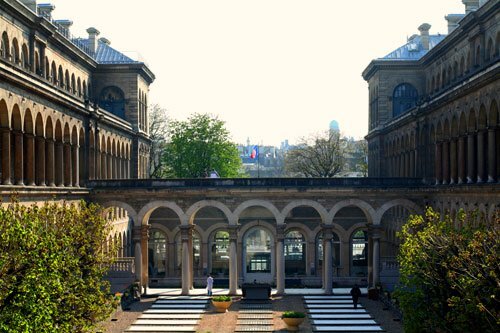 If you’re into staying in odd hotels, the most unusual one in Paris is part of Hôtel Dieu, called Hospitel. 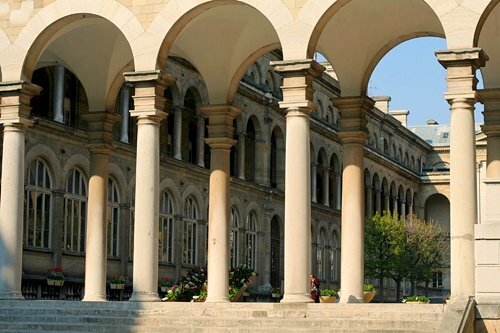 Occupying the top floor of Paris’ enormous public hospital, the hotel is adjacent to Notre Dame and features one of the most beautiful hotel lobbies in the world: a sumptuous, verdant courtyard framed by a sprawl of archways. The location of the Hôtel Dieu was apparently chosen due to its proximity to Notre Dame. (Hôtel in French can mean a large mansion-like building, not necessarily as hotel as we know it.) It was thought that people leaving a house of worship might be more charitable on the way out. Eventually rooms were rented out on the top floor for people visiting patients in the hotel, and thereafter, the hospital opened them up to the public. For those of you that are concerned about noise, I doubt you’ll find anywhere that’s quieter than a hospital. The rooms are serviceable (think of an Ikea-decorated college dorm room), but hospital-clean without a lot of extraneous decoration. Large skylights let in plenty of light, although there are no windows as the “hotel” is on the top floor and the roof is mansardée. Each room has its very own private bathroom, air conditioning to combat the summer heat, a television and telephone, and free Wifi. There’s also a reception desk and I visited a friend who was staying there and the woman at the desk couldn’t have been nicer or more helpful. Prices are reasonable, although not dirt-cheap. Currently the rooms run about €120, unless you’re visiting a patient in the hospital, in which case, the price drops by about 40%. The upside is that the hotel is centrally-located and near Berthillon, in case you need an emergency caramel ice cream fix. The downside is that most of the restaurants and cafés in the direct vicinity are geared towards tourists visiting Notre Dame and aren’t among the best in city. But the best part may be that in case you have an emergency, the non-caramel kind, you needn’t go very far. 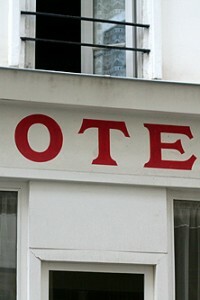 It has been years and years since I’ve been to Paris and we always stayed in very small pension-type hotels. The Hotel Dieu is definitely an unusual place to stay, but one hell of a talking point. I wonder what the food’s like? Angry Brit: Well, I had surgery a few years ago and I can say that French hospital food isn’t much different than hospital food elsewhere. Beautiful photo, David! And, what a lovely concept: providing rooms for hospital visitors! And, the public, too! My only issue with this otherwise lovely accommodation, it that is is well, in a Hospital. However, that place is pretty gorgeous for a hospital, and the price is terrific. Were I not hospital-phobic I might just make a reservation right now. What a cool recommendation, David! As for easy, affordable dining nearby, Le Bar du Caveau (17, Place Dauphine) is a great place to sit, relax, and enjoy a Tartine or salad (or even an American-style breakfast, which they offer, should you want that), while watching the dogs romp and play, as their owners play Bocce Ball in the lovely and quite Square du Place Dauphine. P.S. It’s offbeat stuff like this (and ketchup macarons, crazy museums, and failed layered cakes…), that keeps me coming back for more. Jeebs, those photos are gorgeous!!! I’ve been living in Paris for 40 years and I never… never heard about this hotel!! How funny, I love the idea. I never heard about this kind of hotel in paris or elsewhere. huhuhu, “the non-caramel emergency” :D. Adopted ! The butcher down the street from Berthillon, Jean Paul Gardil, has amazing rillettes de canard, in case there is a duck fat emergency. We have stayed in apartments on Rue de la Harpe, and both of the islands. This hospital was always on our route somewhere. I often wondered about walking inside and taking a look around. I thought I would get stuck in the medical part before I got to the lodging area. I love the neighborhood, but the lack of windows reduces the value of the location. It doesn’t take much to make a place special for something other than its original intent. We love “Lunch at the Orsay”. Drinking a bottle of wine in the Musée d’Orsay dining room is a great experience, even though the menu and food are less than stellar. I can only imagine what a night in the Hospitel could be. I can recall several mornings that I have woken up in a hotel room in need of some medical intervention. 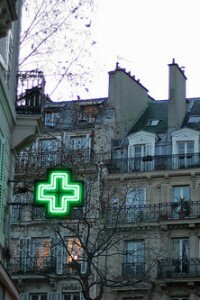 A hospital is extreme, generally a pharmacie is enough to get my $*** together, and my head on straight. Thanks for posting this!! My husband and I stayed here for a few nights on our honeymoon. Very cheap and convenient!!! I work as a doctor hence am fond of hospitals!!! AMR: Too bad the prices have creeped up over the past few years. Especially considering how basic the rooms are. Still, it’s quite the experience staying in a Paris hospital! I’m not so much concerned about how great the food is or not, but the idea of a “hotel” being in the same building as a hospital is a great idea.Having known the need for something like that in a distant city and then trying to find a place in reasonable proximity to the hospital at night after long days with a family member — instead of driving when exhausted, one can easily go take an elevator upstairs. I wonder if any major American hospitals could do this. Very practical concept–which could be easily adapted. I knew the building but I didn’t know there was a hotel there. I have some friends visiting looking for something out of the ordinary so this is a useful tip. Ta. The French have such an interesting sense of, well, logic. When I saw the sign, I was thinking Hospitel as in Hospitality/Hotel. Had a chuckle when I read what it really is. American hospitals need to adopt this idea. My mom had to stay for a couple of weeks when my dad was in a famous hospital here and her accommodations were…a hospital room. Ick. And no such lovely grounds to stroll. You didn’t mention the best part… the courtyard statue! He was dressed like Snow White during my last visit. My parents have stayed there when their regular rental had a conflict. It was great as my dad is in poor health. It’s funny how time changes ones perspective. At my age, finding a hotel room IN a hospital is exactly up my alley! Excellent tip David – both the location and price is right. 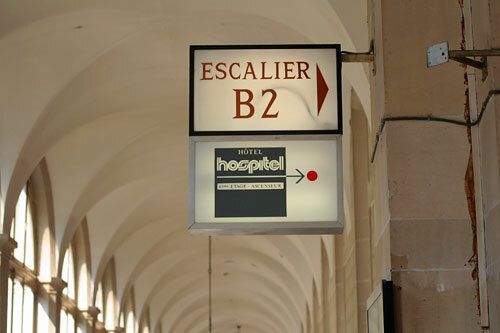 Years ago, I had a foot injury while living in Paris and went to the emergency room here. From here I was sent via taxi to L’hôpital COCHIN for their foot specialist and ended up being staying in this hospital for 2 drug-induced weeks! I just found out I have work engagement in Paris in 3 weeks and I’m taking your recommendation to visit this Hotel, not as a patient this time, but a guest! When I first read this post I thought it was an April Fool’s joke! Decades ago I heard a tale of woe ago about an American couple whose travel agent supposedly booked them a room at the Hotel Dieu. And they were left out on the street. And now it does exist! Do you know how long it’s been around? Thanks for the great tip, David. Ye gods! I have looked all over for the telephone number!! Thank you! I remembered this place from when I lived in Paris years ago – nice blog.